Click on the banner above to go to the site. They claim that CBS gave them access to extensive reference material for the ships. I can confirm, via my eyeballs, that the Enterprise-D is moulded from the "These Are The Voyages" CGI model built on a tight schedule by Gabriel Koerner. I'm not a fan of that model (it's disproportionate, the deflector is squinty, and it's missing a few details), but the mini-ship looks very nicely finished! The Romulan Warbird is also definitely derived from the CGI model built for the Dominion war. I have a suspicion, which some of you may be able to confirm or deny, that a lot of these ships are re-packaged Furuta, Konami, or Johnny Lightning (or others) toys. 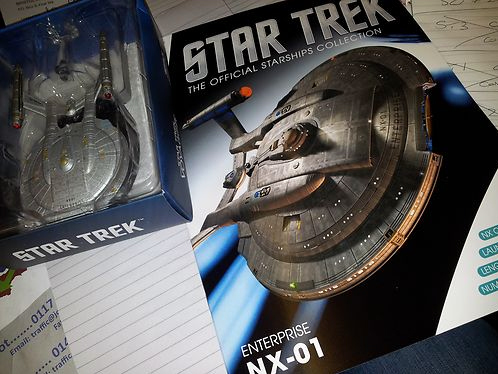 In particular, the Borg Cube, offered as a subscriber incentive (along with a dedication plaque, a binder for the magazines, and a model of the AGT Enterprise-D (for which they fairly obviously reuse DST's old demo model photos from 2009 - the bridge is glowing, fer cryin' out loud!) looks very familiar. Looks pretty good to me. I'd consider subscribing if it wasn't available in the UK only. Sorry guys, I posted that in a rush, and completely buggered up the pictures. I'll re-code it and edit. Ah crap. 8of5 had already done that better! Thanks so much for pointing this out. I've just subscribed - it looks amazing. I'll let you all know what they're like when they start turning up. What was the subscription fee, btw? Hi everyone, I'm new to posting on this forum but I thought I'd finally pop in. Glad to say that I must deny your suspicions, Destructor. They are completely new toolings of those ships and not previously released by anyone. I'm a serious ship collector so you can trust me on this. Apart from the crappy stands, I'm extremely stoked about this line too (Akira!!! ), but it kills me that they're gonna be hard to get if Diamond don't distribute them here in N. America, like they did the SW DeAgostini partworks. I pray they do. You guys in the UK are lucky, very jealous. Looking forward to a review. Thanks for the welcome! Yep, I've got loads of ships, happy to assist. Agreed, it's a red bulb in the Furuta and white/yellow lights in the Playmates and Hallmark cubes. Dunno why green lights were so elusive until now. The new cube looks good to me (nice detailing) but I'm not so sure about the 20 quid claim. I do want one, though. The Star Wars partwork had a very nice exclusive Death Star for subscribers in Europe, if that's any indicator. Kiss the blarney, good luck with Eaglemoss, and please let me know if they'll ship to you in Ireland. I ain't too proud to beg for my Canadian brethren! No fee. They just charge you the price of the magazines and you get the free gifts. Will let you all know what they're like once they start arriving. I spoke to them over the phone, and they said no problem to deliver in the Republic of Ireland. So I signed up... I'm wondering what they're going to charge me in euro now. Import taxes and all. I'm sure if you guys start e-mailing them your interest, they may look for a distribution partner in North America. Good on ya, and thanks for the info. I might try ringng them to see if I can get my relatives to accept delivery in the UK, now that you've paved the way, cheers. Hope you don't have a hard time with customs/euros and I hope you'll post some pics for us disadvantaged and backward types outside of the UK and Ireland. Best of luck, and you can bet your arse I'll post pics. Ah, well played, sir. But I'm half Irish so I always feel justified aboot doling out the cringeworthily cheesy Stage Irish. Begorrah and top of the mornin', eh? Hehe, most of the "real" Irish expressions that I grew up with would get me banned from the forum immediately. So, has anyone received their magazine and ship by post yet? According to Memory Alpha, the first issue was released in May(!). Not received anything yet. As soon as I do, I'll let you all know. It doesn't say Eaglemoss or anything on it, but I can't think of anything else it could be. I'll have to call them during busy-ness hours tomorrow. EDIT: Well, much ado about nothing. The transactions weren't theirs. They say that they are waiting for the stock to fill the order list, and that I should recieve the magazine by the end of the month, probably by the end of the week. EDIT: Which I've just noticed, is the same thing. You had me worried then, Destructor. I thought the line was going down before it even got off the ground! Glad that all is well. 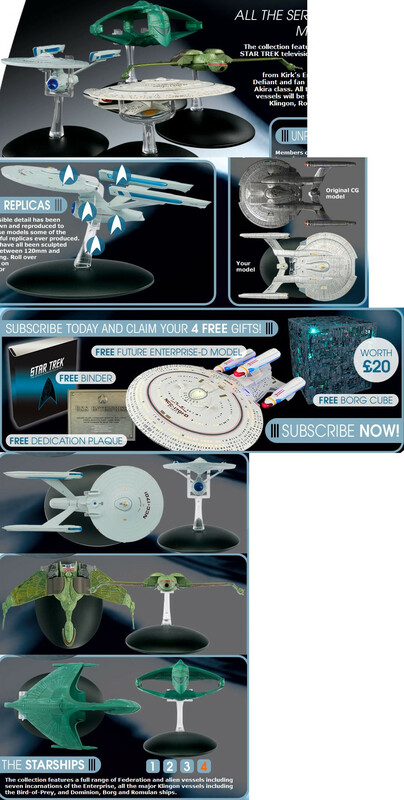 I see that the KBoP is issue #3 and the (now non-white) NX-01 is #4. I've got loads of silver NX-01s so another white one like the Eaglemoss proto and the Johnny Lightning WL might've been nice. Still, looks pretty good, very similar to the Hot Wheels one. I am confused... you have issue - four? I haven't recieved one yet! I am confused... you have issue - four? I haven't received one yet! Nope, I ain't got any of 'em yet; those are pics from eBay auctions. It's possible that the Romulan Warbird is issue #4 as advertised on the EM website but it seems that the NX has preceded it, dunno for certain. But I haven't seen a Warbird yet, anyway. I wonder how the heck the auctioneer got it? !